Every once in a while, we see a company that will make our descendants — the “people of the future” — look back and see us as primitive. A company that combines technological progress and innovation with a market-based approach to challenge conventional and basic truths and present an alternative vision of the future. Meatable, a new company based in Leiden, Netherlands, that solves critical challenges for the successful commercialization of lab-grown meat, is one of those. With that in mind, Future Positive Capital is proud to announce our latest investment, a $3.5m round led by BlueYard Capital alongside Backed VC, Atlantic Food Labs and a few high profile angels. The present meat industry fundamentally challenges the idea of a Future Positive. 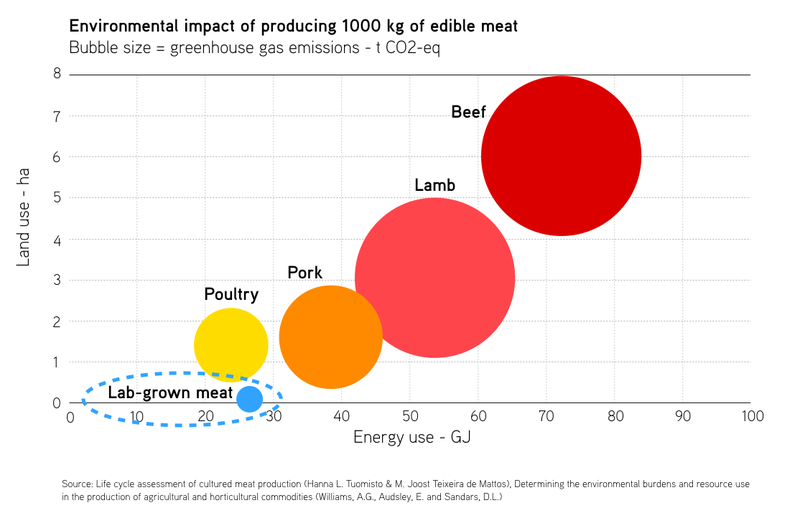 A notorious contributor to global warming and pollution (the industry produces 15% of greenhouse gases and is one of the main causes of eutrophication — freshwater use and water pollution), the meat industry is built on ratios that are fundamentally flawed. Though the industry produces only 18% of the world’s calories and provides only 37% of our protein supply, rearing livestock or producing the crops that feed them uses 83% (!) 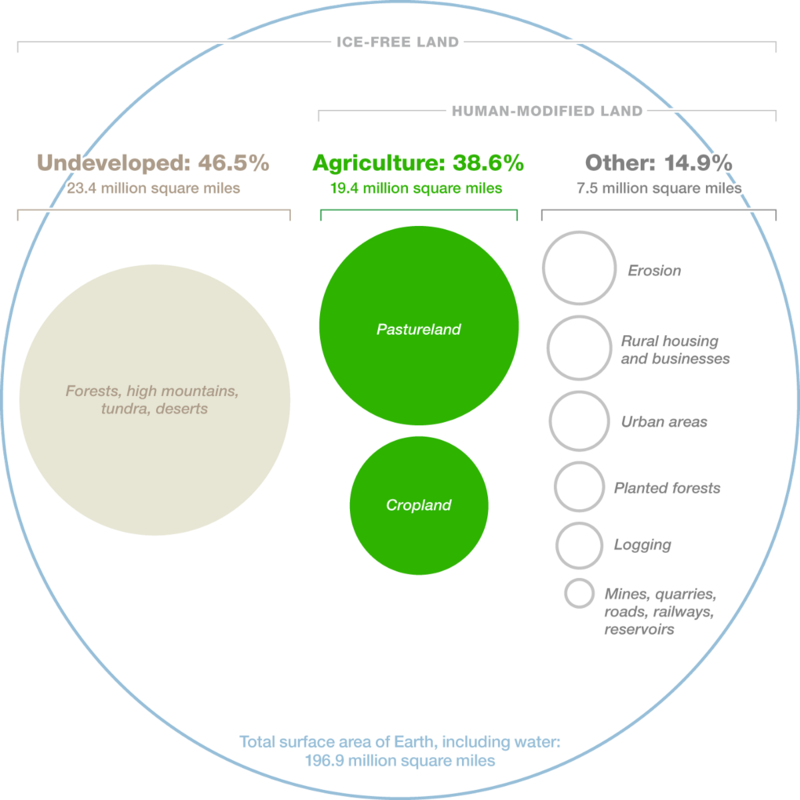 of the world’s arable land (that’s 26% of the world’s total land surface). In a world where deforestation for industrial and single-crop agriculture is also the leading cause of global biodiversity loss (leading to the current mass extinction of wildlife), we are in need of radical and efficient solutions that do not depend on farmland expansion. 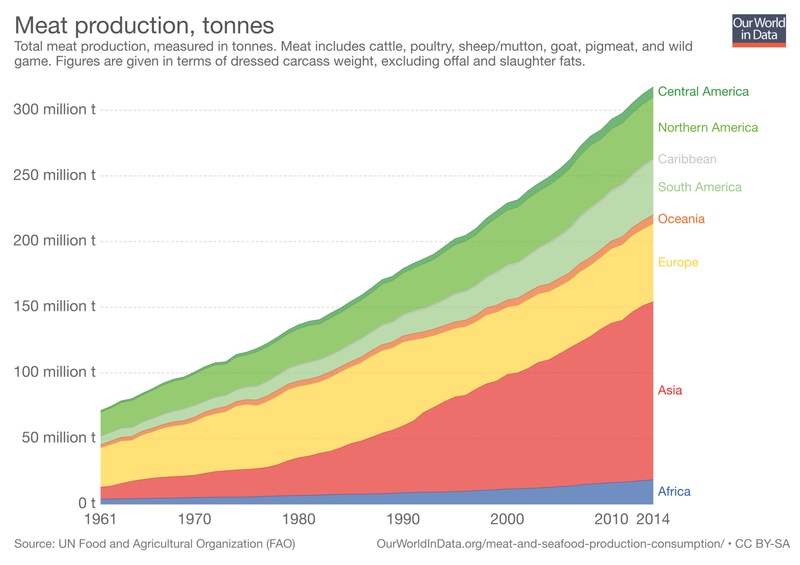 As the population grows to 9.7 billion over the next 30 years, continuing on our current path is effectively impossible, especially since meat is a superbly inefficient way of converting the earth’s nutrients and feeding humans: only about 4% of the protein and 3% of the calories we feed to cows end up in the steaks that we consume. 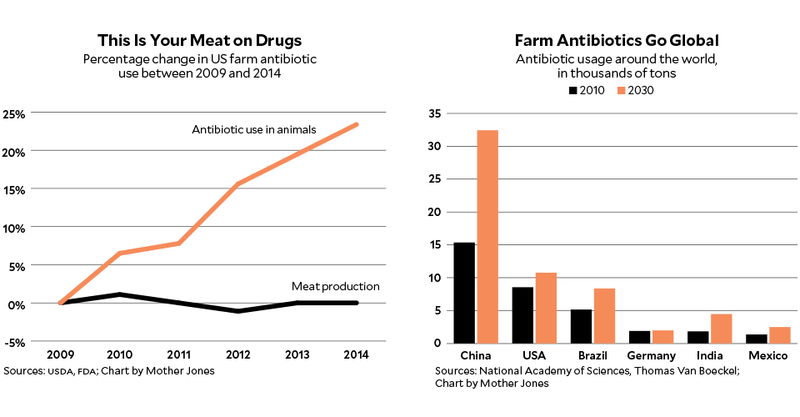 Beyond its environmental impact, the meat industry poses two additional challenges. As the main “consumer” of antibiotics, it is also the largest contributor to the rise of antibiotic-resistant “superbugs”, a phenomenon which the WHO estimates is one of the biggest threats to global health and food security as we head towards a “post-antibiotic era”, in which common infections and minor injuries can kill once again. Finally, regardless of how you view animal rights, it is nevertheless the case that the majority of industrial farms rear animals under conditions that would warrant legal cruelty charges if they were dogs or other protected animals. Nevertheless, meat remains a staple of our current diet and consumption is set to continue to grow. Meat is still one of the best ways for our bodies to get complete proteins as well as key vitamins, minerals and essential amino acids. It helps keep blood sugar levels stable due to its fat content, and helps maintain long-lasting energy. Beyond its functional benefits, consumption is driven by status and taste. For the emerging and global middle class, especially in countries like China (where per capita consumption in China has grown approximately 15-fold since 1961), meat consumption is seen as a sign of success. As the global middle class continues to grow, so will meat consumption. As a result, the global processed meat market, which is already worth USD 714 billion, is projected to grow at a 14% CAGR to a staggering $1.6 trillion in 2022. In this context, lab-grown meat offers a promising and truly exciting alternative. It requires 99% less land and 96% less water, does not require the use of antibiotics, generates up to 96% less greenhouse gas emissions, and does not contribute to deforestation or require the use of fertilizers and pesticides. Some of the world’s most visionary business leaders and venture capital investors share this excitement for lab-grown meat, including people like Bill Gates and Richard Branson who invested in US-based Memphis Meats, or Sergei Brin who funded the world’s first lab-grown burger. The industry, however, has faced a few critical scientific, scalability and ethical barriers. Today’s lab-grown meat is made from bovine muscle cells (also called “myosatellite” or “satellite cells”) that grow in petri dishes. This process poses four critical problems: a) satellite cells have what can be called a “replicability shelf-life”, meaning purified satellite cells can only replicate 30–40 times in vitro, requiring labs to regularly extract additional cells from animals; b) muscle stem cells duplicate into muscle cells but not into fat cells, whereas fat cells provide much of the taste of meat; c) 2D growth in petri dishes requires a lot of physical space, which in turn explodes production costs and makes it virtually impossible to commercialize globally (even considering falling lab production costs); and d) bovine cell cultivation requires fetal bovine serum (FBS) — a by-product made from the blood of cow fetuses that acts as a universal growth medium and is essential for those cells to survive and grow — undermining one of the basic goals of the lab-grown meat industry, namely that lab grown meat production does not require the killing of cows. Meatable was built to solve these problems. Their approach has the potential not only to present the first lab-grown meat burger at a price point that makes it highly accessible to the global emerging middle class, but to become a platform for anyone else to develop new kinds of meats and fish foods. Their core technology is has two key components: firstly the ability to create induced pluripotent stem cells (cells with the capability of becoming any other cell type), and secondly, the ability to differentiate these stem cells into both muscle and fat cells by applying a patent-protected and highly efficient cell reprogramming technology. The former means the company can solve the scalability and ethical challenges of the industry. Induced pluripotent stem cells can proliferate without any limits (through the restoration of telomere length), grow in 3D (bioreactors) instead of 2D (petri dishes) thereby generating > 1000x efficiency gains, and do not need controversial FBS to grow. While this technology is available, other lab-grown meat companies have refrained from using these types of stem cells given how difficult it is to control their replication and differentiation. This is where Meatable’s proprietary technology comes in. Initially developed at the Cambridge University Stem Cell Institute for the purposes of human medicine, this technology brings stem cell differentiation yields from 40% to 100% and means the company can produce high quality and high fidelity batches of both muscle and fat cells at a scale and consistency level unknown to the clean meat industry, giving them the potential to produce lab-grown meat that actually tastes like the meat we love to eat. This also means their entire production could in theory start from a single cell. Beyond producing and commercializing their own clean meat, Meatable has the potential to become a platform for the entire industry as they push the intersection of biology and data to innovate in areas like media composition (optimizing the nutrient broths they use to grow the cells within bioreactors) or tissue engineering (to produce more tender meat). Their technology and achievements can in turn both serve and inspire others to imagine, design and create totally new kinds of “meats”. While we remain of course conscious of the potential challenges to the lab-grown meat industry, including the upcoming fight against the powerful lobbies of the meat industry and the need to define a more specific regulatory framework, we are convinced that Meatable’s proprietary technology combined with their world-class team of clean meat, pluripotent stem cells and cell reprogramming scientists gives them the means to deliver on their vision — commercializing clean meat at scale for every consumer. At Future Positive, we are seeking to support the 20 most iconic European companies that apply advanced science and technology to solve a global need. Meatable is undoubtedly one of those. If you’re interested in what we’re doing, please get in touch. We are hunting and gathering.